If the sound quality for receiving starts to get fuzzy, please disconnect the clear tube ear piece and blow it out with an air in a can, because the air in the tube will effect the transmission. If you clear the tube earpiece and the tube earpiece is intact, but the issue still isn't solved, please contact us. The advanced materials PU cord allows you totally get long period happy use; Length of the cable (Plug to PTT): 135cm; ideal for some outdoor and indoor activities, such as: camping, hunting, hiking, birding, photographing weddings and etc. Thanks to the transparent(clear tube) earpiece, it provides you definitely low profile conversations in noise environment. 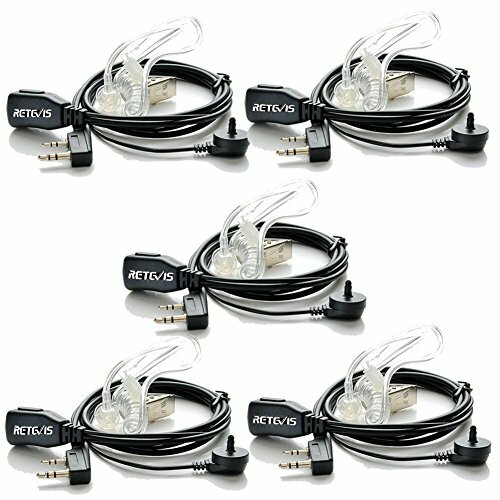 The soft ear bud stay in ears well and fell fairly comfortable to get loud and clear sound from your partners. The sensitive built in mic with clips allows you clip it to you collar close to mouth for picking nature and clear voice to transmit.